Members gain lifelong friendship with fellow members of fraternal organizations. The bonds of friendship are strengthened throughout your college years and throughout life. These bonds are not only found amongst the local collegiate chapters but also spread across the nation and internationally. Fraternities and Sororities strive to combine their common goals and ideals of a brotherhood or sisterhood with the unique college experience. Fraternity and Sorority organizations maintain active alumni relations programs that offer possibilities for career networking. The Fraternity and Sorority community offers countless opportunities for exploring and developing leadership skills. These organizations offer leadership positions within the chapter, and strongly encourage, and in some cases, require other leadership activity on campus and in the community. Fraternity and sorority members are involved with countless clubs and organizations on campus and can offer guidance to new students wishing to get involved. 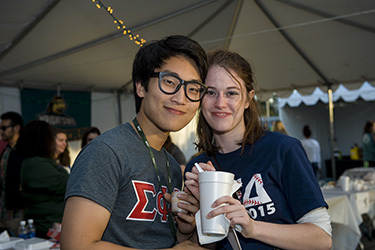 Fraternity and Sorority Life members have made significant contributions to Wright State. Joining the F/S community could possibly be the best decision you make to grow as a leader. The foundation of the college experience is a good education. Fraternity and Sorority Life is a plus that will help heighten your college experience. Academics are important to Fraternity & Sorority Life at Wright State. Most Greek letter chapters at Wright State require you to maintain a certain GPA to remain an active member. In many cases the groups offer National Scholarships to members that meet specific academic criteria. One of the most unique qualities about a Fraternity or Sorority member is dedication to service. Each Fraternity or Sorority hosts its own philanthropic events to raise money or donates their time to a specific cause. They also assist the Wright State and Dayton area communities with community and philanthropic efforts. Members of Wright State University’s F/S community participate in a range of service projects and support various philanthropies such as: RAINN, Big Brothers/Big Sisters, Think Pink Foundation, Raiderthon, American Cancer Society’s Relay for Life, and other local and national organizations or events. Giving back to the community and Wright State are priorities Wright State Greeks emphasize. In 2018 our Fraternity and Sorority community reported $30,000 in philanthropy donations, and 32,000 hours of community service!